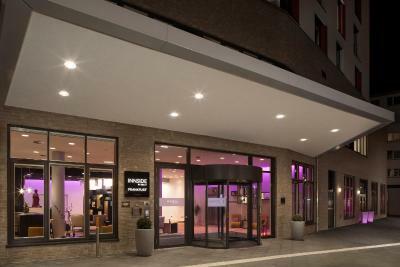 Lock in a great price for INNSIDE by Meliá Frankfurt Ostend – rated 8.8 by recent guests! It is my favorite hotel in Frankfurt. I always try and stay there as I really like the modern type of hotels. I loved the free mini bar, that touch made a huge difference on service. Everyone can offer you service, but free mini bar? that was really awesome. The hotel is located at a central location. There is a minibar with some free beverages. The room is designed in a beautiful way. Would definitely recommend to stay there. The hotel is modern and comfortable. Bathroom is open concept so make sure you are sharing the room with someone you know well. The staff were helpful - I had a cold and tea helped relieve my cough, and they provided me a kettle for hot water. The room was extra clean and very airy, something I quite like in a hotel room. The bed was amazing, big and comfortable. Mini bar in the room was also free of charge. 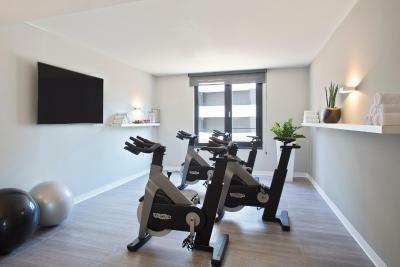 There is a gym you can use on the second floor. Outside, you can locate a number of stores, and the waterfront is across the street. 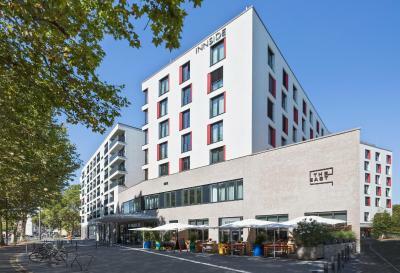 It is a very good, practical option to stay in Frankfurt - pretty, functional, clean and conveniently priced. I like the neighbourhood where it is located. You have great access to a supermarket and the metro station. It is quiet and not as hectic as other locations. The restaurant - bar is very pleasant. I have stayed here twice and quite enjoyed it. Very clean room and friendly staff, free drinks in the minibar, nice spacious shower. We enjoyed our short stay a lot and fully recommend staying here. This place was awesome! Wished we had more time there. The property is beautiful! Beds and rooms are awesome. Staff was very friendly. Super close to several train lines. Its super good value for money. Big rooms, clean comfortable bed, nice neighborhood and Incredible huge well sorted delicious breakfast! 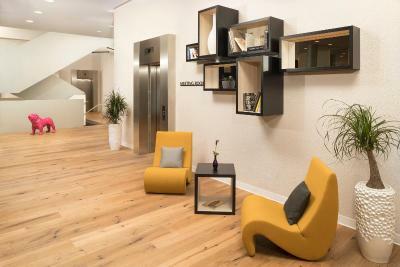 INNSIDE by Meliá Frankfurt Ostend This rating is a reflection of how the property compares to the industry standard when it comes to price, facilities and services available. It's based on a self-evaluation by the property. Use this rating to help choose your stay! 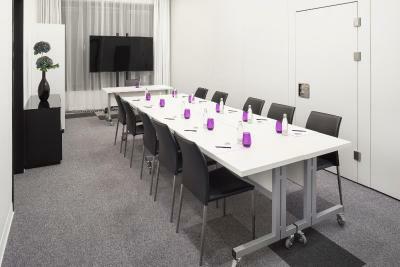 This 4-star contemporary INNSIDE by Melia Frankfurt Ostend hotel is located 900 feet away from the Frankfurt Ostbahnhof Station. 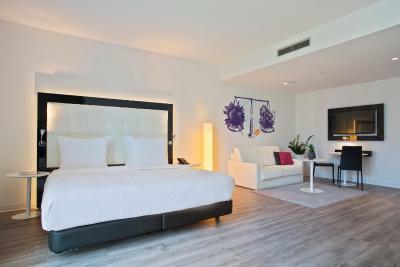 It offers bright rooms with an on-site bar and free unlimited WiFi access. Each room at this hotel is air conditioned and features a flat-screen TV. Rooms have a private bathroom. For your comfort, you will find free toiletries and a hairdryer. Guests are welcome to enjoy free usage of the sauna and a fitness room at the property. There is a 24-hour front desk at the property. Fair Frankfurt is 3.3 mi from INNSIDE by Melia Frankfurt Ostend, while Cathedral of St Bartholomew Dom St Bartholomaus is 0.9 mi away. 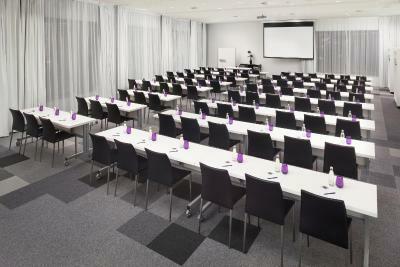 The nearest airport is Frankfurt Airport, 11 mi from INNSIDE by Melia Frankfurt Ostend. 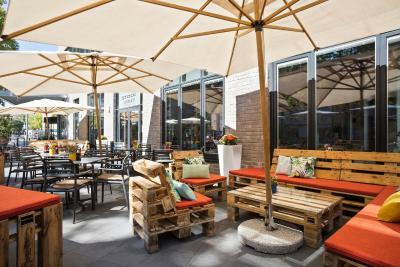 When would you like to stay at INNSIDE by Meliá Frankfurt Ostend? This twin/double room has a mini-bar, soundproofing and air conditioning. There is also a free mini-bar, adjustable air conditioning and a bathroom with a rain shower. 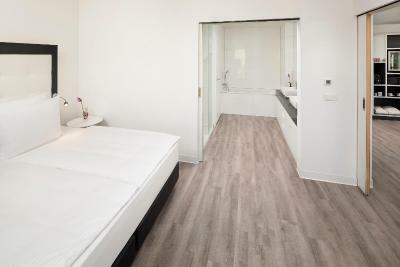 This double room features air conditioning, mini-bar and soundproofing. There is also a free mini-bar, adjustable air conditioning, a bathrobe and slippers, a coffee machine and a bathroom with a rain shower. This double room features a view. There is also a free mini-bar, adjustable air conditioning, a bathrobe and slippers, a seating area, a coffee machine and a bathroom with a rain shower. This suite has a free mini-bar, soundproofing and satellite TV. 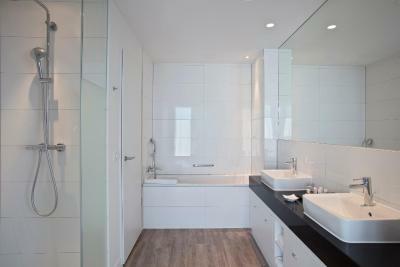 There is also a bathroom with a rain shower and bathtub, a seating area, a coffee machine and a bathrobe and slippers. 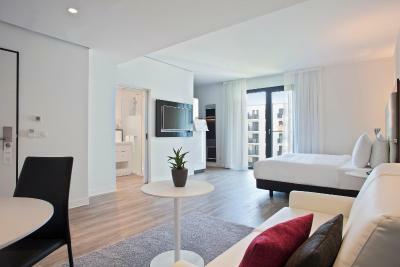 House Rules INNSIDE by Meliá Frankfurt Ostend takes special requests – add in the next step! 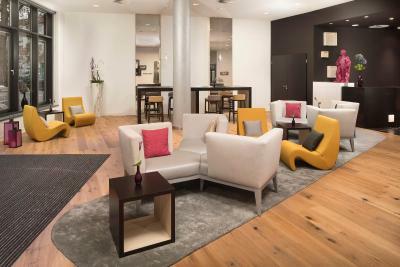 INNSIDE by Meliá Frankfurt Ostend accepts these cards and reserves the right to temporarily hold an amount prior to arrival. Great location in a nice neighborhood, friendly staff and good service in the bar. Good restaurants in the area within walking distance and the street car stop is right in front of the site. Thought the parking cost for one night €20 was very expensive. I booked hotel as it offered parking, but worked out quite expensive to park there! Didnt avail of breakfast as we found it to be expensive at €22 each. Restaurant wasn't open for evening meals at weekend that we stayed. Staff were very friendly and helpful. Good location, was walking distance from the centre of the city. Room was exceptionally clean with free minibar. It was also very quite on our top floor. Super comfortable bed. The shutters were a great way to make the room dark at any time. Plenty of space in the room as well. The supermarket downstairs is really convenient, and you can walk to a lot of places easily. The pillows were not so comfortable. They were too big for my taste. The location was great, close to the train station. I loved the room decoration. The receptionists were extremely helpful. Location is not very close to center but with subway we could reached center easily. Receptionists were polite, room was very clean and big enough. There were free soft drinks in minibar. Was unclear that you had to pay for parking. Fantastic rooms, well appointed with good amenities. Lovely building and staff. The room was clean, comfortable and facility was quiet. Excellent sauna and exercise facility. Great staff; friendly and helpful. Nice brunch buffet. Overall great place to stay when in Frankfurt. No kettle. Restaurant had very limited menu but across the road is a great cafe.Anis.